Its such a small thing, but sometimes little things help keep everything running smoothly. In Windows XP, take a file and copy it – Windows helpfully renames it to ‘Copy of [Filename]’. 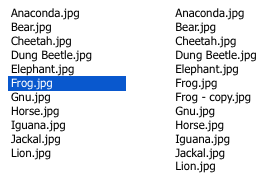 Unfortunately, it shows up at the bottom of the list of files in the folder, meaning you’ll have to hunt for it. Even more unfortunately, if you re-sort the folder by name – its still lost, since it’ll sort with the ‘C’s. Roll on a few years and here is Windows 7 getting it right. The copied file is named ‘[Filename] – copy’. By default it shows up right next to the original and it’ll keep on sorting next to the original too. Here’s OSX also doing it right. The copied file is named ‘[Filename] copy’. Again it shows up next to the original, making it easy to find.